Some people, with no apparent problems with their eyes, report that it is “uncomfortable” to look at certain patterns – including a page of words. Some people find that the words appear to move, wobble or flicker while others see colours or patterns in the words. This tends to make reading for any length of time uncomfortable and can lead to eyestrain, headaches or even migraines. It can also affect reading speed and fluency. It can be associated with Dyslexia, ADD/HD, Autism, Asperger syndrome, Dyspraxia, Chronic fatigue syndrome, Migraine and Headaches. For reasons that are still not well understood, these disturbing effects can often be reduced or even eliminated by placing a sheet of coloured plastic (an overlay) over the page or using coloured lenses. Interestingly, the colour required to achieve this varies from one person to another and the colour can be different for overlays and lenses. There is increasing evidence that it is due to nerve cells in the area of the brain responsible for vision becoming over-stimulated by certain patterns. For some the benefits may be slight but for others the effects can be dramatic, significantly increasing reading speed and fluency and reducing headaches and eyestrain. A school teacher in New Zealand (Olive Meares) and an educational psychologist in the US (Helen Irlen) were among the first to report this phenomenon so the condition has become known as Meares-Irlen syndrome or simply Visual Stress. Here at C.A.T.S we provide a complete range of solutions for those with Meares-Irlen syndrome, by offering high-quality, evidence-based products at affordable prices, including coloured overlays, coloured reading guides, coloured clip-ons and coloured non-prescription and prescription spectacles. What symptoms should I be looking for if I think my child has Meares-Irlen Syndrome? Moving closer to or away from the page or frequently changing position. Excessive blinking or looking away from the page. Tiring quickly. Concentration may be poor and attention span may be short. Poor understanding of reading text. Speed or rate of reading is slower than expected for intelligence level. 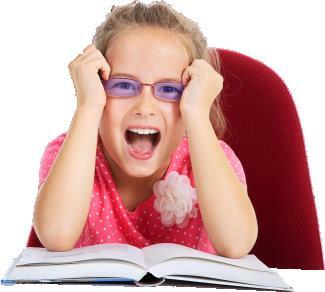 If you have noticed that a child is doing any of the above, it is usually a good idea to get their eyes tested to rule out various other causes – it may be that they simply need glasses or eye exercises. However, if the behaviour persists, they may have Meares-Irlen syndrome. A coloured overlay assessment is carried out only after a full eye examination and after the appropriate spectacles or exercises have been prescribed. The symptoms can vary from mild to severe and many people are unaware that they have this condition – “I have always been a slow reader”. Many individuals have never seen print correctly and are not aware that the way they see the printed page is not clear or stable. They think everyone sees the page the way that they do. Studies have shown that at least 20% of the population get some benefit from coloured overlays, and 5% read significantly faster with a coloured overlay. Meares-Irlen can be a significant disadvantage when learning to read and children with the condition may be wrongly labelled as having Dyslexia or being poor readers. Some people find that the symptoms of Meares-Irlen decrease as they get older. For others, the condition is with them for life. There is no cure at present, but the symptoms can often be reduced and sometimes eliminated by using a coloured overlay or coloured lenses. Print clarity, stability and reading comfort can all be provided with the right coloured overlay which in turn can improve reading ability. The colour required to minimise symptoms varies from one person to the next so it is important that you try a range of different colours. The optimum colour can also be different for overlays and tinted lenses and can vary over time so it is worth rechecking from time to time. Coloured overlays – These are rectangles of thin coloured plastic. Coloured overlays are designed to be placed over a page of a book or any other written material. 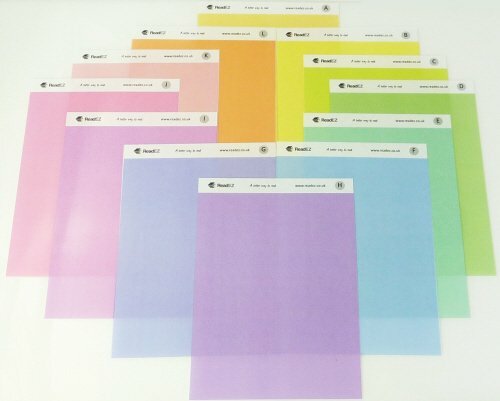 We have overlays available in 12 colours. The colour and saturation of each overlay has been carefully selected by a team of vision scientists. The overlays are made of durable acetate and come in A5 sheets making them ideal for use with books and pages of any size. Coloured overlays are great for reading but of course you cannot write through them! Overlays are also no good for reading from the whiteboard or looking at a computer or tablet screen. This is where the clip-ons come in. 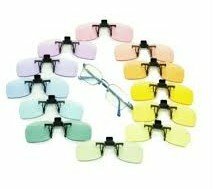 If you wear glasses, the clip-ons simply clip over the spectacle frame and you can enjoy the benefits of your preferred colour whatever you are doing.The clip-ons are available in the same 12 colours as the overlays although the optimum colour can be different for lenses and overlays. You may also prefer to have a pair of spectacles made up with the specific tint you have chosen. If you do not require a spectacle prescription, you can order our non-prescription spectacles with your ReadEZ tint or if you currently wear spectacles tinted prescription lenses can be supplied. If you would like to be assessed or have your child assessed you will require a full eye examination including extra tests to check the binocular vision status of your eyes. Please call for more information.